But while things are certainly heating up in Kyiv, they are not as desperate as might seem. 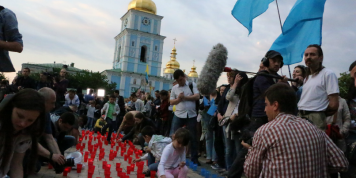 The violence outside the Rada, while deadly, was not popularly supported. The public has generally sided with the government and police force. Hundreds of people have come to the parliament since the deadly blast to lay flowers. Soldiers fighting on the frontline have publically called on their fellow citizens to remain calm and refrain from violence, arguing that the country doesn’t need a civil war in addition to the ongoing war with Russia. The events may also mark another milestone in the eventual end of the non-parliamentary Freedom Party, one of the main protest organisers. They have been losing support and now its leaders are being investigated for their role in last Monday’s violence. Moreover, the professionalism of the police – who detained the main suspect immediately after the explosion, pacified other violent protesters and swiftly proceeded with criminal investigations – is seen by many as a marked change compared to the way the infamous Berkut riot police dealt with peaceful protesters on Maidan under the previous regime. This departure of Oleh Lyashko’s Radical Party from the coalition has prompted questions over the current government’s sustainability: the move came a day after the Parliament adopted on the first reading constitutional changes giving more power to Ukraine’s regions (including, in the long-run and after free elections take place there, to regions currently controlled by the separatists). Like Yuliya Tymoshenko’s Bat'kivshchyna, the Radical Party was a smaller partner in the ruling coalition. Both parties’ have bet heavily on populist slogans and have frequently criticised the government. While neither Tymoshenko’s nor Lyashko’s party voted for the decentralisation on Monday and the government was unlikely to find allies among the opposition to pass the bill in its final reading before the local elections in October anyway (it would require a two thirds super-majority), the Radicals’ move nevertheless complicates the coalition politics. It gives the two remaining small coalition partners – mayor of Lviv Sadoviy’s Samopomisch and Yuliya Tymoshenko’s Bat'kivshchyna – more weight in the coalition. It also makes the two key coalition blocs – President Poroshenko’s Bloc and Prime Minister’s Yatseniuk’s National Front – more dependent on ad hoc deals with unsavoury partners such as the Opposition Bloc (the re-branded Party of Regions) and groups of “independents” (which often act as fronts for oligarchs’ interests). This has already been the case last week – the decentralisation bill was approved only thanks to the support from the parliamentary opposition, including the Opposition Bloc. More importantly, it places even greater importance on ensuring that the president’s and prime minister’s own MPs support the government policies. This will be a challenge: the party discipline in both blocs has been loose at best. Even though the government in theory commanded a comfortable constitutional majority in the Rada until last week, reportedly, less than half of government-proposed bills were adopted. Many of those that passed had been changed by ruling parties’ MPs beyond recognition. By comparison, the reformist coalition government of Mikulas Dzurinda in Slovakia in 1998-2002 had more than 90 percent of their bills supported by the parliament, even though the coalition was unwieldy (it included former communists) and its reforms unpopular. The space for parliamentary discussion and oversight of the government should never be restricted – yet in Ukraine, the Rada’s deliberations often morph into sabotaging the government’s reform policies in the hope of extracting favours for individuals or business groups. Ukraine has had few coalition governments in the past two decades and none of them was very functional; the-winner-takes-all approach is still the preferred style for most Ukrainian politicians. The departure of one of its partners this week does not mark the end of the current ruling coalition. But it does highlight the need for Ukrainian politicians to start engaging in serious coalition politics, with all its complex internal deals, checks and balances and face-saving involved. The authorities’ already daunting task have just grown even more difficult.